Arizona Department of Transportation sent this bulletin at 09/05/2017 02:50 PM MST. If you would like alerts on this and other ADOT news, sign up above to receive our GovDelivery notices. 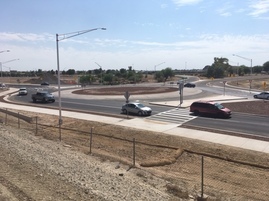 YUMA – The Yuma area’s first modern roundabout for a freeway interchange has opened at the Giss Parkway ramps connecting with Interstate 8. Some work remains on the $2.5 million project to replace a T intersection for the on- and off-ramps from westbound I-8, the last exit before drivers reach the Colorado River. The project also includes improved lighting, signage and drainage, as well as accommodations for cyclists. Work began in March and will be completed this fall. ADOT crews also are constructing two modern roundabouts at Araby Road in Yuma.